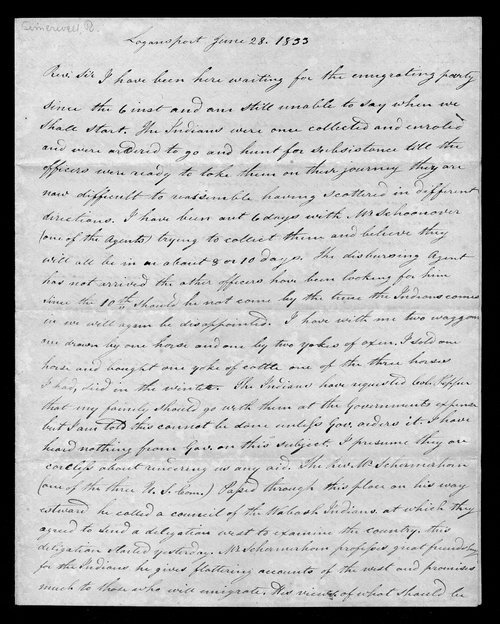 In this letter to Reverend Samuel Bolles, Robert Simerwell reports that he has been waiting several weeks for the party of emigrating Potawatomies to arrive at Logansport, Indiana, where they were slated to gather before heading West. Simerwell states that he has two wagons with him for the journey, and that the Potawatomies have requested that his family be allowed to accompany him at the U.S. Government's expense. However, Simerwell states that he has received no word on the subject, and that he presumes that the U.S. Government is "careless about rendering us any aid."